Read the whole review below, or jump to any section using the main headings below and the sidebar on the left. Or you can download a complete copy of this sector review as a pdf document to read separately. Prison services are one of the worst environments for corruption in all spheres of public life. They combine large numbers of people held against their will and deprived of access to a normal range of goods and services, looked after by a relatively small number of prison officers who often are poorly paid and of variable quality, integral connection with crime and organised crime, tight funding that precludes many improvements, limited external scrutiny and little public interest in what goes on inside. Prisoners furthermore have many ways in which they can threaten or blackmail prison staff into working corruptly for them. The historical funding model of prisons – that prisoners should fund the running costs of the prison – is still largely in place today in many countries, with low-paid prison officers having to obtain the rest of their remuneration from the prisoners, prisoners having to buy their own food and medicine, pay their own transport to go to court, and so on. All these payments are the system, not some malfunction of the system. Furthermore, in many countries, the prisons are full of the marginalized in society, with only a minority of serious criminals. The better prison systems therefore tend to be the ones that keep the smallest percentage of the populations incarcerated, such as in Scandinavia, treating the other offenders via different forms of societal support. Definition. Prisons are ‘places of detention within a criminal justice system, holding all prisoners, including those who are held during the investigation of a crime, while awaiting trial, after conviction and before and after sentencing’, according to the UNODC definition. The originating author of this review is Katie Fish. Additional contributions have been made by Mark Pyman; Phil Wheatley. There are many different types of prison corruption. They include grand corruption, such as being able to run criminal enterprises from within prison and drug related criminality, and the many forms of petty corruption that takes place in prisons every day, such as paying for a phone call or an extra blanket. No-one has yet produced an agreed typology of all the different types of corruption in prisons. UNODC discusses four categories of corruption in prisons: Bribery, Abuse of function, Trading in influence, and Embezzlement and misappropriation. Transparency International UK notes that the corruption that occur in prisons can be grouped into two broad categories – manipulation and implantation. ‘Manipulation’ includes threats, intimidation, inappropriate relationships, preying on staff disaffection, whilst ‘Implantation’ means placing corrupt individuals directly within the prison service. Goldsmith et al. (2016) discuss the categories of ‘Inappropriate relationships, Trafficking, Assaults, Use of force and control, Inappropriate dealing with client information and procurement, Kickbacks and Fiddles’. Corruption is frequently related to the treatment of and conditions for prisoners. Prison officers or prison staff may seek bribes from prisoners or their families to perform particular services or acts in respect of their required duties. Prisoners in turn may bribe officers to facilitate the smuggling of contraband (mobile phones, drugs, weapons) into prisons, to gain employment opportunities or other privileges, to influence the physical location of prisoners (both within and between different prisons) or parole decisions. The bribes themselves may take the form of anything of value; they may be monetary or can take the form of sexual favours or other services. Contraband includes licit commodities (phones, alcohol, cigarettes, food, cash, knives) as well as illicit commodities (drugs, guns etc). The sums of money involved can be very large. For example, “one estimate puts the value of the UK prison drug trade at £100 million per year, with an average of seven corrupt officers at each prison facility.” Goldsmith et al. (2016). Prisons can also be susceptible to more general forms of corruption affecting public organisations. 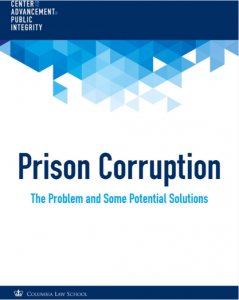 “[M]any of the opportunities and vulnerabilities for procurement corruption in correctional environments mimic those experienced elsewhere in the public and private sectors (e.g. public health).” ( Goldsmith et al. (2016)) Prisons are large often unwieldy organisations contracting with many external parties. Large prison contracts can be attractive to criminal organisations and officials seeking private gain. Prisons are also at risk of misappropriation of public property for private use; this may include prison vehicles or other property. Corruption in prisons can be linked to the following key relationships: Between prison officers and prisoners, Between prison officers, prisoners and a third party (usually on the outside), Between prison officers and prison management, and Between prison staff (non-officers) and prisoners. The grooming of officers in order to corrupt them can take place both inside prisons and from the outside. There is a clear market for information about notorious offenders or potential key witnesses in upcoming criminal trials. Usually this form of corruption relates to unauthorised access and disclosure by officers to others inside or outside the correctional setting. The beginning of the anti-corruption effort should start with establishing a baseline for the types and forms of corruption in a particular setting. This may also be viewed as undertaking a risk assessment. It should provide information on the extent and location of corrupt activity, as well as the form/s it is currently taking. It should cover working arrangements, as well as the physical features of the prison. This information, often not easy to come by, may be gathered by anonymous surveys or intelligence gathered by independent commissioned experts. Prison officers, prison staff and prisoners will all have information about the extent of corruption and many will be concerned about the issue. Finding a safe way to encourage them to contribute is essential. Others connected to the prison, from key suppliers to those involved with the prison at a local and national level may also have relevant information, if they can be persuaded to contribute to the assessment. Wider involvement in this process is more likely to result in wider ownership of the resulting plan. There are no reliable formal corruption assessment tools in the prison context. “Those that do exist seem aimed primarily at identifying if the particular facility has the tools in place to help prevent corruption rather than to identify individuals who may be susceptible to or actively involved in corrupt practices.” (Hill 2016). Example: Corruption vulnerability with the prison system of the Philippines. Consultation with key stakeholders, namely prison staff and the prisoners themselves, should also be incorporated in any assessment and prioritising process. Goldsmith et al. (2016) argue that a broader focus on integrity (values) in such consultations rather than anti-corruption (rules) allows “more scope in such a consultation to harness the input of both staff and clients, because there will often be a less-immediate threat to particular practices or interests and greater ability to focus concern on common problems and the harms associated with particular corrupt practices.” (Goldsmith et al. (2016)). Many of the anti-corruption tactics and measures discussed, particularly in the UNODC’s recently published handbook, echo the responses to corruption in other sectors. There is a focus on the importance of the right tone from the top, the use of corruption risk assessments, the importance of a code of ethics, conflict of interest policies, training, independent oversight, and suitable sanctions with teeth, secure reporting mechanisms and transparency. Better searches (body scanners) for everyone at entrances and exits/cameras installed etc. Prison administrations should consider the establishment of a dedicated anti-corruption unit – with the mandate, power and resources to implement and oversee anti-corruption measures (UNODC 2017). Many of the greatest corruption risks in the prison setting involve the manipulation of prison staff, including both prison officers and civilian staff (such as healthcare professionals, teachers, cleaning staff, etc.). The importance of proper recruitment processes, background checks, training and ongoing performance management and adequate pay/rewards for prison staff should not be underestimated. This work should be undertaken against a foundation of clearly expressed values underpinning how staff operate in prison, backed by investment in staff development. Standards of behaviour for prison staff must be set, focusing specifically on what appropriate behaviour looks like in the prison context. Prison staff should be subject to active supervision by their managers and able to access ongoing support around relationships and counselling where required. Standard setting should also include reference to social behaviour outside the prison that might open up staff to blackmail and compromise them. This should include social media use. Having clear social media policies for people working in prisons is increasingly essential to reduce exposure to potential corruption risks and particularly the possibility of being groomed for corrupt behaviour. Once in position, there should be thought given to whether there needs to be rotation systems for roles that involve security screening and significant interaction with manipulative prisoners. This may be particularly important in smaller communities for staff working in prisons located close to their homes and/or those of prisoners. Vetting should be an ongoing process. Staff must be required to declare conflicts of interest and there should be regular audits of social media use. 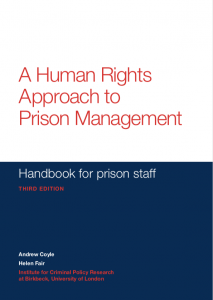 There is a wide-ranging handbook for prison staff – Coyle and Fair 2018 A human rights approach to prison management: a handbook for prison staff – that is freely available online which is informative. Though it says little about corruption, it has a lot of guidance on integrity building as a key part of good prison management. The manual is now in its third edition and has been reprinted in some 20 languages. Countries such as New Zealand and the US have had some success with specific situational measures, such as mobile phone jammers. However, in Colombia and El Salvador authorities have taken the approach of modernising security features and imposing maximum security to break the control of the prison gangs. This has not been successful. There is certainly an argument to be made for improving situational prevention measures (security check points, use of mobile phone jammers) but when instituting or updating such features the dynamic factors (prison officer culture and motivations) must also be considered. This should particularly be the case when considering the smuggling of contraband. Given available staff and resources, it is not realistic to expect prison authorities to thoroughly (strip) search everyone coming into and out of the prison every time. Even a strip search is unlikely to be fully effective, as it will not detect packages of drugs hidden internally. The only effective method of technology for detecting such items is specialist x-ray screening. This requires well trained operators, but it is not possible to screen high numbers quickly through this process. The most intensive screening and searching should be targeted using available intelligence on those at greatest risk of being involved in smuggling in illicit items. There are also ways to reduce the demand for contraband items. 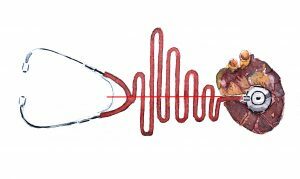 Often those using mobile phones simply want a lifeline to their family and friends on the outside. So, why not make it cheaper and easier to use landlines from the prison? Corruption in prisons, especially when it involves corruption by prison guards, may need formal investigation by domestic intelligence or investigation agencies. Example: In the US, the FBI launched a formal program in 2014, Operation Ghost Guard, to root out corruption by prison officers. This has led to dozens of prison officers being indicted for accepting bribes from inmates in Georgia, and a better understanding of the ways in which the corrupt relationships develop. Similar investigations have continued elsewhere in the US, eg Ohio, Mississippi, Alabama. Nino Monea, writing in the Global Anticorruption blog in 2016, proposes raising wages for prison guards, from what are usually very low levels; Improved working conditions; and improved training and screening of guards to help them identify and resist the gradual compromise of relationships. “Where the rewards for misconduct far outweigh the risks of being apprehended, near perfect conditions for corruption ensue.” (Goldsmith et al. (2016)). Both internal and external oversight are necessary. Those responsible for prison management must set the right ‘tone from the top’ by demonstrating a commitment to encouraging the reporting of corruption, ensuring effective investigation of corruption which leads to the prosecution and punishment of those found guilty. Prison staff, prisoners and anyone else witnessing corruption in the prison must have access to effective means of reporting corruption. Prison management must actively encourage reporting and must have a clear non-retaliation policy openly committing to supporting whistle-blowers. This is very much part of building a culture of integrity within the prison. “Creation of an independent Ombudsman available to inmates, staff and the public. Creation of an independent inspection process. It can be totally apart from the prison services such as the UK’s HM Inspectorate of Prisons or industry-wide such as the American Correctional Association Commission on Accreditation. Facilitate open access to prisons by the International Committee of the Red Cross, Amnesty International, Human Rights Watch and national human rights agencies. The Scottish Prison Service Management and Information Department conducts an annual inmate survey in all prisons. The survey forms are given to each inmate who fills it out in private, places the completed survey in an envelope, seals it and personally hands it to a member of the survey team. The comprehensive survey covers all aspects of prison life, including treatment by staff and other inmates. The entire survey is given to management within 20 working days and key results are posted in the main inmate living areas. South Africa, in 2006, under the Civil Society Prison Reform Initiative instituted a comprehensive study on Corruption in the Prison Context. The full report was made public and used as the basis for investigations and public debate. Jurisdictions in Australia, Canada and other nations have Independent Prison Visitors who regularly visit the prisons and talk to prisoners, staff and visitors. They provide recommendations to the Minister of Corrections. Private and uncensored mail, visits and telephone communications between prisoners, their attorneys and judicial authorities provide inmates with access to ways to report corruption or inhumane practices. Access to independent Employee Assistance Programs provide avenues for correctional personnel to obtain help prior to falling into corrupt practice as well as having a way to indicate potential institutional weaknesses that could facilitate corruption.” (Goldsmith et al. (2016)). In 2002 the United Nations adopted the Optional Protocol to the Convention Against Torture. This entered into force in 2006 and established a system of regular visits to places of detention by a sub committee appointed by the UN Committee Against Torture, complemented by sustained regular visits conducted by national independent inspection groups (Quoted in Coyle and Fair 2018:10). Striking a balance between the control and care of prisoners is important. Often one critical factor in prisoner involvement in corruption is the boredom of prison life. Individuals need a certain amount of stimulation. Demand for contraband items such as drugs can be increased if there is a lack of stimulation from other avenues. Ensuring that prisons treat prisoners decently and provide opportunities to engage in positive activities may be more beneficial to ensuring control and order in prison than simply focusing on enhancing security measures. See for example Dudley and Bargent (2017) The Prison Dilemma: Latin America’s Incubators of Organized Crime. Many Latin American countries have dangerous and overcrowded prisons with significant organised crime problems. Corruption is a recognised part of this issue. However, these prison systems are known to have larger institutional problems and anti-corruption efforts appear often to be part and parcel of larger prison reform initiatives, the success of which is often difficult to assess (Dudley and Bargent (2017)). The experience in Latin America is interesting and useful as an example of what has not worked in terms of anti-corruption efforts in prisons. In some Latin American countries overcrowded prisons with active criminal organisations prison authorities responded in some cases by segregating people according to gang affiliation. The authorities had hoped to reduce the power and influence of the gangs by separating them. This effort had the opposite effect than that desired by the authorities, as it in fact further fostered the development of gangs. By being segregated, gang members were able to use the time to regroup and strengthen themselves. In Latin America, some have argued that authorities continue to opt for hard-line approaches even though the evidence suggests that particularly in the local context these policies are ineffective. Fully 81% of prisoners are being held as a preventive measure and have never faced a trial. They can stay in prison for up to six years if they do not have the money to pay for a court case. But being in prison is not cheap either. According to a report published in Pagina Siete (2014), prisoners have to pay to have a place to sleep. If they have a hearing in court, they have to pay 200 bolivianos to be accompanied by a policeman as the law requires, 200 bolivianos to rent the car, and 100 bolivianos for the secretary in the prison to turn on the computer. Even if the accusation has been withdrawn, if they do not have money to pay to receive a release order, they stay in prison. Relatives and friends also have to pay to visit them. Thus, many people are in prison not because of what they have done, but because they do not have enough money to leave. According to the Ombudsman, Rolando Villena, ‘the cumulative caseload, the insufficient number of courts, the complexity of procedures, the culture of pseudo-dispute, and the dehumanization of justice, has generated a huge, chaotic and uncontrollable system that directly affects the citizen and becomes a retardation that at this point seems to have no solution’ (Pagina Siete, 2014). Jorge Isaac Von Borries Méndez, former president of the Supreme Court, suggests that a main reason for these issues is a lack of capacity of the judicial system to cope with its workload. On the one hand, there are not enough judges: ‘When I was president of the Supreme Court in 2010-201 we had 300 cases in litigation. Now we have 1200 cases, four times more than before.’ On the other hand, the fact that just nine judges have to review all the cases and that everything is still done on paper, slows things down considerably (Zuniga and Heywood 2015). Relatives of detainees, merchants, religious figures and lawyers are among the volunteers working in the Community Councils (conselhos da comunidade), which represent society in the monitoring of the prison system and in the resocialization of convicts. These Councils must be created in each district, at the initiative of the judge responsible for criminal execution, with a composition of at least one representative of the commercial or industrial association, a lawyer appointed by the Brazilian Bar Association (OAB), a public defender selected by the general public defender and a social worker chosen by the Sectional Office of the National Council of Social Workers. In addition, participation is open to relatives of prisoners and representatives of other social segments. All counselors work voluntarily, without compensation. Example: Australia. Corruption in Australian prisons is also a recognised problem in the. Research and responses undertaken by the Australian authorities are worth investigating. Australia has also assisted other countries in South East Asia, such as the Philippines, with corruption prevention efforts in the prison context. Example: South Africa. There has been significant scrutiny of the South African prison system, which is known to have a serious corruption problem. Professor Lukas Muntingh has written extensively on the subject. Example: USA. Anti-corruption reform attempts can be seen in multiple institutions, largely in response to high-profile scandals. E.g. : New York City Department of Investigation and Rikers prison. See the useful report from the Centre for the Advancement of Public Integrity (2016), Prison Corruption: The Problem and some Potential Solutions. Once you have done the analysis of the prison-specific corruption issues (Section 1), and you have brainstormed with colleagues and others on what reform approaches and specific reform measures may be feasible in your context (Section 2), the third part is to think through and develop an overall strategy. The recent UK national anti-corruption strategy specifically identifies prisons as a high-risk sector. The following plan has been agreed for the UK prison and probation services (HMPPS): ‘Develop a new anti-corruption strategy for prisons and probation in England and Wales in 2017, to ensure our aims and approach meet the nature of the current threat and will inform a range of future work to address vulnerabilities. Work is already being taken forward to improve training in HMPPS, to strengthen staff resilience and reduce risk, to improve intelligence sharing capabilities between HMPPS and law enforcement so we are more effective in identifying corruptors in custody, and in taking action in response; and to continue to improve the way that we identify and counter the activities of corrupt staff and their criminal associates (for example, we are working to improve reporting of suspected corruption by raising awareness among staff in the National Probation Service, and Community Rehabilitation Companies)’. It is understood that in the UK each prison has a ‘Corruption Prevention Manager’; however, publicly available information about this role is limited. However, other than the reform examples quoted above, we have not been able to find other examples of sector-wide strategies for prison corruption reform. UNODC are the only transnational groups who are active on anti-corruption measures in prisons that we are aware of. We are not aware of any transnational initiatives to reduce corruption in prison services. Andrew Coyle, Professor at the University of London and co-author of A human rights approach to prison management. Handbook for prison staff, available in some 20 languages. Andrew Goldsmith, Professor in Criminal Justice – Matthew Flinders Distinguished Professor at the College of Business, Government and Law, Flinders University, Adelaide, Australia. He is the author of “Tackling Correctional Corruption: An Integrity Promoting Approach”, Crime Prevention and Security Management Series, Palgrave Macmillan, 2016. Lukas Muntingh, co-founder and project head of the Civil Society Prison Reform Initiative (CSPRI) in South Africa. See here. Muntingh has been involved in criminal justice reform since 1992 and was Deputy Executive Director of Nicro (the South African National Institute for Crime Prevention and the Reintegration of Offenders) prior to joining CSPRI full-time. John Podmore has 25 years of experience in the UK prison service as prison governor, inspector, health consultant and Head of Anti-corruption unit. He is the author of ‘Out of Sight Out of Mind: Why Britain’s Prisons are Failing. Centre for the Advancement of Public Integrity (2016), Prison Corruption: The Problem and some Potential Solutions, Colombia Law School, September 2016. Hill, G (2015), Corruption risks in the criminal justice chain and tools for assessment. Chapter 5: Detention and corrections, U4 Anti-Corruption Resource Centre, U4 Issue No. 4, January 2015. Prison Safety and Reform (2016), Ministry of Justice, HM Government, London, November 2016. Baliton EA (2008) Understanding the Integrity Development Review (IDR) Project, Prospects and Challenges (presentation), Public Assistance and Corruption Prevention Office, Governance and Anticorruption Working Group, January 2008. Beltrán A and Davis A (2014) Prison Reform in Latin America: The Costa Rican Experience, WOLA (online), August 2014. Cavendish A (2016) Prisons: The Elephant in the Room, Prison UK: An Insider’s View (online), 22 February 2016. Criminal Justice Commission (2000) Queensland Prison Industries: A Review of Corruption Risks, Research and Prevention Division, Criminal Justice Commission, Brisbane, August 2000. Development Academy of the Philippines (2007) Pursuing Reform Through Integrity Development in the Bureau of Corrections, EC-OMB Corruption Prevention Project, Integrity Development Review of the Bureau of Corrections, October 2007. Erasmus J (2014) Prison Corruption Taking Us Backwards, Corruption Watch (online), August 2014. 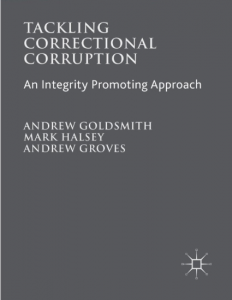 Goldsmith A, Halsey M, and Groves A (2016) Tackling Correctional Corruption: An Integrity Promoting Approach, Crime Prevention and Security Management Series, Palgrave Macmillan, 2016. https://www.amazon.co.uk/Tackling-Correctional-Corruption-Prevention-Management-ebook/dp/B01G34E7TG/ref=sr_1_fkmr0_1?ie=UTF8&qid=1531729205&sr=8-1-fkmr0&keywords=Goldsmith%2C+A%2C+Halsey%2C+M%2C+and+Groves%2C+A+%282016%29%2C+“Tackling+Correctional+Corruption%3A+An+Integrity+Promoting+Approach”%2C+Crime+Prevention+and+Security+Management+Series%2C+Palgrave+Macmillan%2C+2016. Gunn B (2012) How Corrupt Prison Screws can Harass Prisoners, Ben’s Prison Blog: Lifer On The Loose (online), 21 June 2012. 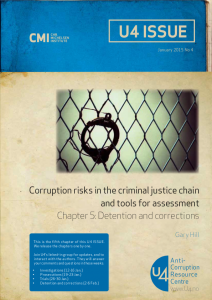 Hill, Gary (2015) Corruption risks in the criminal justice chain and tools for assessment. 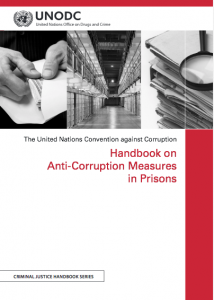 Chapter 5: Detention and corrections, U4 Anti-Corruption Resource Centre, U4 Issue No. 4, January 2015. https://www.u4.no/publications/corruption-risks-in-the-criminal-justice-chain-and-tools-for-assessment-chapter-5-detention-and-corrections? Holmes R (2016) The Secret Prison Corruption Epidemic the Government Doesn’t Want You To Know About, Buzzfeed News (online), 6 December 2016. Independent Broad-based Anti-Corruption Commission (2017) Corruption risks associated with the corrections sector, State of Victoria, November 2017. Independent Commission Against Corruption, New South Wales (2013) Investigation into the smuggling of contraband into the Metropolitan Special Programs Centre at the Long Bay Correctional Complex (Operation Drake), January 2013. Marshall S (2016) Some Realistic Steps to Address Corruption in Cambodia’s Prisons, The Global Anticorruption Blog (online), 16 October 2016. Monea N (2016) How Prisons Corrupt – And What To Do About It, The Global Anticorruption Blog (online), 9 December 2016. Muntingh L (2008) The Struggle Continues: The fight against corruption in prisons, SA Crime Quarterly, No. 25, September 2008. National Offender Management Service (UK) (2016) National Security Framework Ref: NSF 14.0 CORRUPTION PREVENTION – HOW TO IDENTIFY, REPORT AND MANAGE STAFF CORRUPTION IN PRISONS AND HEADQUARTERS, Security Management Function, NSF 14.0, March 2016. Paterno B (2015) Cells for Suites: Why Corruption in Prison Matters, and What To Do About It, The Global Anticorruption Blog, 10 April 2015. Podmore, John (2015) Prison systems need to acknowledge widespread corruption, Penal Reform International (online), 25 January 2015. Podmore, John (2017) What can save our prisons from chaos? The governors, The Guardian (online), February 2017. Samball C (-), A Daily Hazard: Corruption Risks in Corrective Services, Corruption and Crime Commission of Western Australia (presentation), date unknown. Sturcke J (2006) Prison suspends 14 officers in corruption inquiry, The Guardian, 14 August 2016. Travis A (2006) Leaked report accuses 1,000 prison officers of corruption, The Guardian, 1 August 2006. United Kingdom Anti-Corruption Strategy 2017-2022 (2017) HM Government, London, December 2017. United Nations Congress (1977) Standard Minimum Rules for the Treatment of Prisoners, adopted by the First United Nations Congress on the Prevention of Crime and the Treatment of Offenders, Geneva, 1955, and approved by the Economic and Social Council in 1957 and 1977. Yanokovich D (2017) Private Prisons Embrace Corruption to Boost Profits, The Huffington Post (online), December 2017.